Pizza Rat is OK, but Pizza Bear is the far superior Pizza Animal. Via the Colorado Springs Police Department’s Twitter page. The Internet was enamored with a pizza-loving rodent on Monday, with #PizzaRat topping the local trending topics in New York. Gawker’s “Pizza Rat, Pizza Rat, I Love You” headline was typical of the admiration Web denizens were showing for the creature. If you don’t want to watch gross videos like the one below, though, I’ll just tell you that Pizza Rat is a disgusting rodent trying to pull a slice of pizza down a flight of New York City subway stairs. That’s it. It’s pulling the pizza. And then it stops. I suppose part of the thrill of Pizza Rat is seeing two common occurrences for New Yorkers—a rat on the subway and a single plain slice—combined in a whimsical pastiche of what makes the city so magical (“Whatta town!”). But I contend that Pizza Rat is not a particularly good meme. It’s true that as of Monday afternoon, Pizza Rat was trending in New York, Washington, Los Angeles, and San Francisco. But places like Raleigh, Harrisburg, Salt Lake City, and Omaha were completely ignoring Pizza Rat in favor things like #BYUvsUCLA and #mondaymotivation. No, Pizza Rat just doesn’t have national standing as a Pizza Animal Meme. It is more the province of Pizza Beast coastal elites. But there is a different, better Pizza Animal to save us from the tyranny and repulsiveness of Pizza Rat. 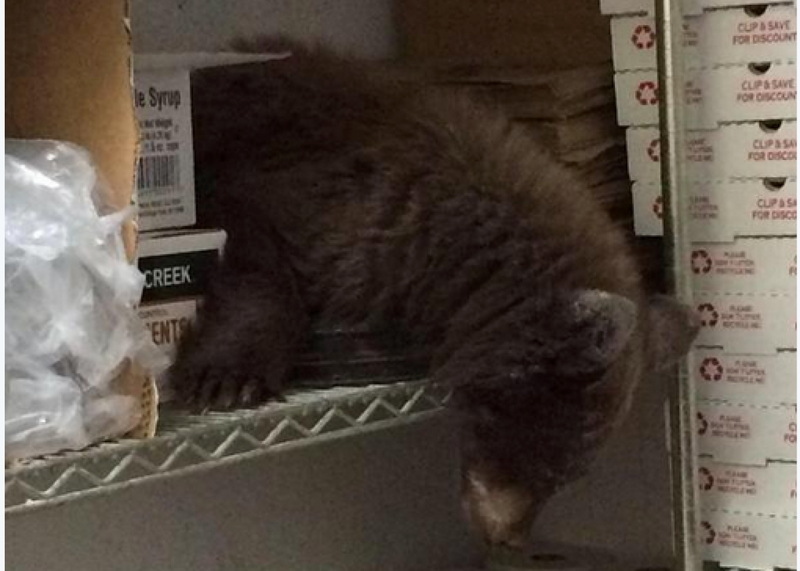 That animal is Pizza Bear, the cute, little bear cub that broke into Louie’s Pizzeria in Colorado Springs one week ago. First off, Pizza Bear is an adorably drowsy fur ball rather than some disease-carrying vermin. Part of the appeal of Pizza Rat is probably an imagined backstory for how it came to be (Where did it get that slice of pizza? How did it get so far with it?) and the memories Pizza Rat conjures of the beloved rodent-based animated children’s feature film Ratatouille about a similarly disgusting animal that also happens to like human food. But the reality is that rather than Pizza Rat taking a mystical journey with its pizza from a Manhattan kitchen, across city blocks, and into the depths of the subway, some drunken B&Ter probably just dropped a slice at the top of those stairs after a night of Jager bombs, and Pizza Rat happened to be there to pull it down a half a flight before giving up. In addition to being from the heartland, Pizza Bear actually has a charming and in-character backstory to go along with its pizza adventure. According to the Colorado Springs Gazette, “The animal entered through an open door, walked past the restrooms and found its way into the pizzeria’s prep room.” Pizza Bear then “ate some icing used in Louie’s cini-bread and curled up on the second shelf of a storage rack” for a nap. Very Yogi like. The bear was then brought in by police and Colorado Parks and Wildlife, presumably on one count of being a bear (it’s unclear if anyone else was arrested on any count of being an accessory to being a bear). Pizza Bear, you are the true champion of the Pizza Animal jungle.